Burford Capital: AIM's biggest firm still growing fast | City A.M.
By Graeme Evans from interactive investor. This AIM star is already big enough to make the FTSE 100, but City analysts argue it is worth even more. 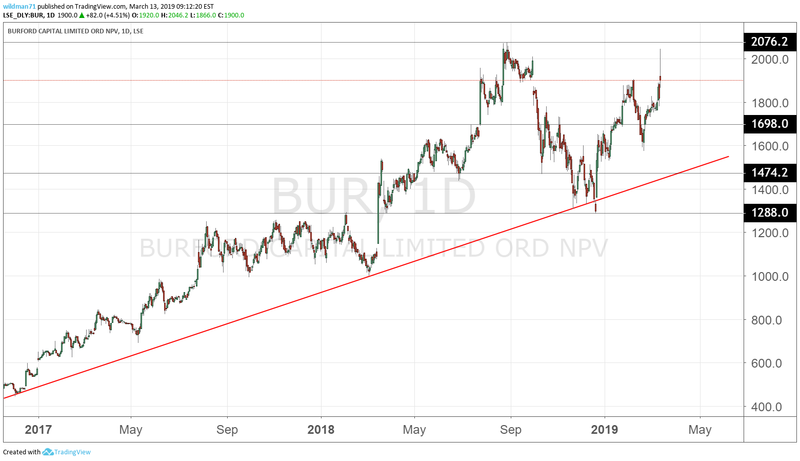 The extraordinary story of Burford Capital (LSE:BUR) continued in earnest today as the AIM market's biggest stock delivered another record year of significant profits growth. With shares up as much as 10%, the business litigation funder is now worth over £4 billion and close to the valuations of Marks & Spencer (LSE:MKS) or Wood Group (LSE:WG.) in the lower reaches of the FTSE 100 index. That's a remarkable feat for a company only co-founded 10 years ago by Time Warner's former general counsel Christopher Bogart in the wake of the AOL merger, which had just produced the largest corporate contingency fee in history. Bogart is still at the helm of New York-based Burford, having filled a gap in the market providing capital to the legal sector so that commercial litigation cases can proceed. Today's results showed no let-up in the pace of growth, with net profits up 24% to $328 million based on an operating margin of 84%. The return on equity was 30% in 2018. Barford has committed $2.6 billion to new investments in the past two years alone, more than twice the cumulative commitment in the period prior to that. Bogart describes this as "extraordinary" and a "sea change in the legal finance marketplace". The company met that demand by raising capital on its balance sheet and by making use of its new investment management business, including a ground-breaking deal with a sovereign wealth fund to facilitate US$1.6 billion in litigation finance investments over four years. "The big question this year was whether 2017's explosive growth was a one-time anomaly. These results show that it was not." The sovereign wealth fund deal helped reinvigorate the share price in December, having suffered in the stock market wobble since October. The shares are now back close to the 2,000p levels seen in the summer, although analysts at Liberum think that a price of 2,470p is achievable after lifting their price target from 2,300p in the wake of today's results. Liberum noted that the $1.1 billion of capital deployed in the year was significantly higher than its own "bullish" prediction for $600 million. "Returns achieved are the highest in the firm's history, despite the competition. The case that this is the winner in a growth industry is much tougher to assail now. We note 41 employees putting $6 million of their own money into Burford funds. Follow them." Macquarie continues to value the stock at 2,540p based on opportunities in Burford's biggest market of the United States and the near-term growth prospects in Australia, Germany, Netherlands, Hong Kong and Singapore. Numis Securities, which has a price target of 2,300p, said Burford was now showing a sustainable trend of growth and that as it gets larger its returns should be more predictable. It has Burford trading on a projected 2020 price/earnings (PE) multiple of 13.6x. One side issue is how much longer Burford plans to remain an AIM stock, given that it is now comfortably bigger than ASOS (LSE:ASC) and another AIM shooting star in Fevertree (LSE:FEVR). A place on the main market would certainly boost the profile of this fast-growing stock. *Horizontal lines on charts represent levels of previous technical support and resistance. Trendlines are marked in red. These articles are provided for information purposes only. Occasionally, an opinion about whether to buy or sell a specific investment may be provided by third parties. The content is not intended to be a personal recommendation to buy or sell any financial instrument or product, or to adopt any investment strategy as it is not provided based on an assessment of your investing knowledge and experience, your financial situation or your investment objectives. The value of your investments, and the income derived from them, may go down as well as up. You may not get back all the money that you invest. The investments referred to in this article may not be suitable for all investors, and if in doubt, an investor should seek advice from a qualified investment adviser.